ELIZABETH CITY, N.C. – Halloween is just around the corner and the usual traditions are pumpkin carving, trick-or-treating, and haunted houses. We have something better for you though! 1. Teach’s Hole – Named after Edward Teach, or as most of you know him, Blackbeard the Pirate. This is a small cove on Ocracoke Island and the exact location Blackbeard’s execution took place. This mischievous pirate was beheaded and the rest of his body was thrown overboard. There have been reports of seeing a headless body swimming in the cove and it searching on the beach for its head since that dark day in 1718. 2. Cape Hatteras Lighthouse – In 1812 Theodos Burr was lost in a shipwreck here. His soul is still wandering the shores late at night close to the lighthouse. 3. 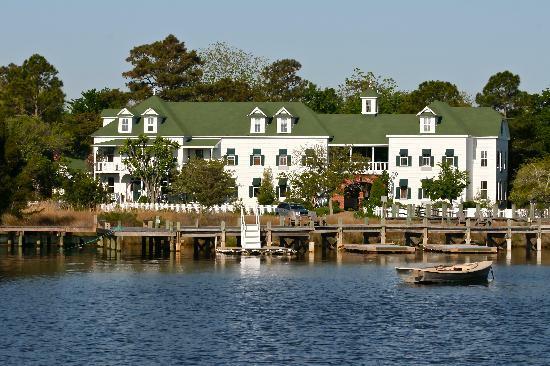 Roanoke Island Inn – It's haunted by a pervious owner of the inn, Roscoe Jones. He was the postmaster for many years in Manteo and died in the house from depression. Now people see a figure of a man in a postal uniform. Other occurrences include hearing footsteps, vases breaking, blinds moving, and a radio powering on. 4. Graveyard of the Atlantic – There have been thousands of shipwrecks in the Diamond Sholes area off Cape Hatteras from severe weather and strong currents. An unknown amount of human lives have been lost to these waters and people say that they see ghost ships and can here the sounds of drowning screams even to this day. 5. Flaming Ship of Ocracoke – Seen just past the coast of Ocracoke is a ghostly, flaming ship that sails every first night of the new moon. In the 1700s a sailing vessel brought refugees from the Rhine Valley to the New World. While the ship was anchored off shore the crew robbed and killed the immigrants and then pulled the anchor and abandoned ship. No matter what speed and direction the wind is blowing though, the ghost ship always sails northeast. Instead of doing the usual Halloween festivities visit the best haunted places in the Outer Banks! Even if you don’t see anything while you’re there, you got to visit some really cool landmarks. Remember that fall is also the best time to complete a maintenance routine on your vehicle before the weather gets cooler. If there’s any type of auto service you need help with stop by our used car dealer near Corolla, NC. We’ll take care of anything from your tires to a major repair.